Electronics stores across the UK may be organising swift layout changes after Apple won an EU trademark to cover the layout of its distinctive Apple Store retail locations. The trademark, which is similar to one Apple owns in the United States, will prevent copycat stores, of which there are currently plenty across the UK, mimicking the look and feel of the official Apple outlets. The stateside mark covers the Genius Bar, the lighting, the furniture and the facade of Apple Stores, which doesn't leave a whole lot for those 'me too' stores to legally copy. 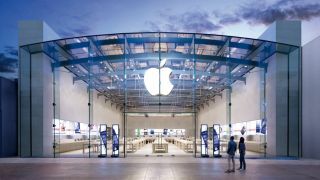 Apple must prove that there's confusion among consumers when they step into an offending store before legal action can be brought in the US. The European Court of Justice ruled: "The Court concludes that the representation of the layout of a retail store, by a design alone, without indicating the size or the proportions, may be registered as a trade mark for services." Seems a rather high court for a ruling on the look of a retail store, but this is Apple we're talking about. Will stores around the country be rushing to change their layouts in light of the ruling? Let us know your thoughts below. In depth: Did Apple Stores save Apple?